Alexandra Ocasio-Cortez is currently making news in the US at the moment with her proposals for a Green New Deal. 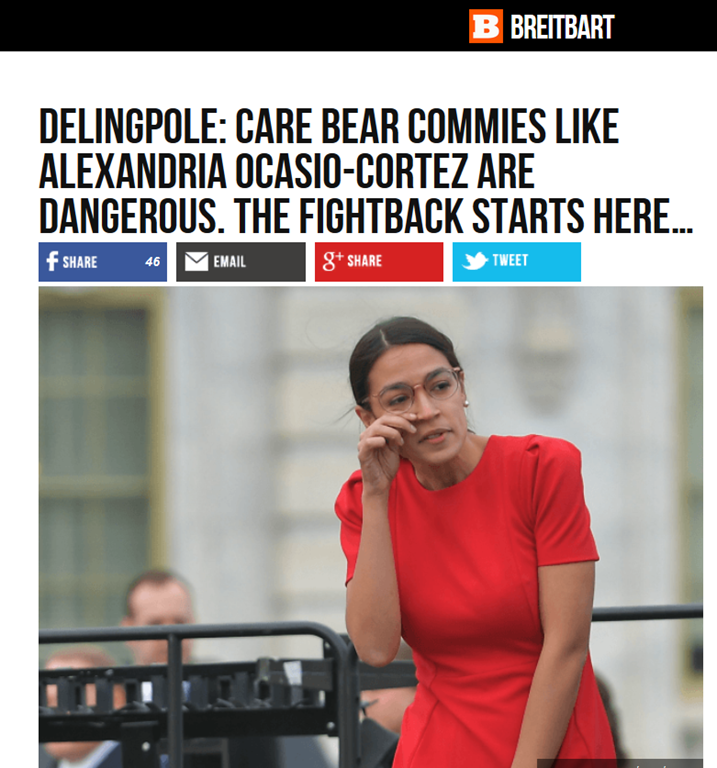 Dellers described her and some of her counterparts over here as “Care Bear Commies” – all those youthful, telegenic, smiley, hard-left activists you see across the media reassuring your kids that actually communism is likeable and fun and the only reason it gets such a bad rap is that it hasn’t been tried properly yet. Alexandra, or AOC as she is known as, the newly elected US Representative for New York, first really came to public attention after the mid-terms, when she called for the setting up of a Select Committee specifically to draft a bill for this Green New Deal. Nevertheless, AOC is still pushing for her Green New Deal plans to be formally adopted by the Democrats. It was Bernie, along with Van Jones, Bill McKibben and AOC, who hosted the National Town Hall on Climate Change Solutions to introduce the Green New Deal to the world. While this event looked like a gathering of disparate groups throwing their support behind this new movement, it was actually a gathering of compatriots working together to promote their common agenda. The basic idea of the GND is simple. It operates by obvious analogy to President Franklin Delano Roosevelt’s 1930s economic recovery program, which was built on massive government spending and intervention in every aspect of the economy. In the case of the GND, supporters have two purposes in mind: a) provide massive public investment and employment in order to b) rapidly transition the U.S. economy to a state of maximum environmental friendliness. Ocasio-Cortez’s proposal for a select committee conspicuously leaves out a lot of the details of how, exactly, these goals would be achieved. What the proposal does specify is the committee’s expected output, a "detailed national, industrial, economic mobilization plan… for the transition of the United States economy to become carbon neutral and to significantly draw down and capture greenhouse gases from the atmosphere and oceans and to promote economic and environmental justice and equality." To achieve these lofty aims, a Green New Deal would need to check a number of boxes. Within ten years, Ocasio-Cortez wants to see 100% of national power from renewable sources; a national smart grid; an upgrade to "every residential and industrial building" for energy efficiency; "decarbonizing" of industry and infrastructure; "massive investment" in the capture of greenhouse gases; and "green" technology as a major export. However, the real goal of the GND goes way beyond climate objectives. It is all about imposing a series of radical, socialistic programs—policies that would dramatically increase the size and power of the federal government, cause immense harm to the U.S. economy, and run up the national debt by trillions of dollars. Much of the goal of Ocasio-Cortez’s GND proposal does not seem to be about environmental policy at all. While light on solutions for actual implementation, the proposed bill incorporates a number of popular far-left economic ideas as part of "a historic opportunity to virtually eliminate poverty in the United States and to make prosperity, wealth and economic security available to everyone participating in the transformation." To accomplish this, the bill calls for the implementation of, among other things, a universal job guarantee, a universal basic income, universal healthcare like Medicare for All, and the creation of a public bank to supplement hugely inflationary monetary policy expected from the Federal Reserve. The whole concept of the GND is not only economically illiterate, it is energy illiterate as well. Currently, renewable sources only supply 7% of the US total energy consumption. The idea that you could switch over for the other 93% in less than a decade is criminally incompetent. We need to bear in mind, after all, that ACO’s legislation could not even be initiated until after the 2020 elections, and would inevitably take years simply to enact. And nobody has yet found a way to run the US power grid on intermittent wind and solar power, without running the risk of damaging blackouts. And this is before we even touch on the question of fossil fuel consumption for non-power uses, such as transport, domestic, farming and manufacturing. Far from eliminating poverty, as AOC intends, her policies on renewable energy would make energy much more expensive, damaging standards of living for the poor particularly, and leading to higher costs and job losses in industry. Such a massive revolution in energy policy would also inevitable lead to catastrophic loss of jobs in those industries which rely on fossil fuels, directly or indirectly. Oil production and refining, coal mines, power stations, steel firms, car manufacturers, and the chemical industry are all examples of industries which are either directly involved with production/processing of fossil fuels, or are heavily dependent on them. The US accounts for 15% of world emissions of CO2, or 5087 MtCO2. Yet emissions from Asia Pacific are triple those of the US, accounting for 49%, and are continuing to grow each year. At their current rate of growth, whatever reductions are made in the US will be more than offset in Asia. Which brings us back to the real reason behind the GND – the hard left agenda of redistribution of income, high taxes and big government. Investment in renewable technology, smart grids, upgrading buildings for energy efficiency, guaranteed jobs, universal basic income and Medicare for all. Who on earth is going to pay for this? Higher taxes certainly, but experience tells us that higher tax rates achieve little in actually raising revenue. As with all far left socialists, the fall back is borrowing and printing money. And we all know where that leads.